From the Syllabus: In this course we will examine representations of gender, sexuality, and desire in Jewish literature. 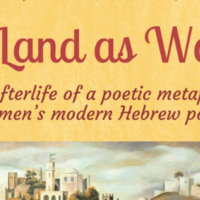 Our readings will span a broad range of literary texts, from biblical stories to contemporary American Yiddish Literature. This course will serve as an introduction to both gender studies and Jewish literature. No prior knowledge of Jewish culture is required. We will begin our discussion by looking at biblical texts and modern poetry to see how contemporary poets interpret and reinscribe biblical motifs for a modern audience. We will then move to prose, looking for example at the first Jewish autobiography written by a woman in 17th century German. Our readings will also take us to 19th century Eastern Europe and early 20th Western European literature to examine how Jewish writers imagine their own bodies and how Jewish bodies became a source of European cultural anxiety. Finally we will turn to the figure of the “Jewish Mother” in contemporary American Jewish Culture. As we read, we will interrogate how gender categories shift in different historical and social contexts; how Jewish men and women write and represent gender differently; and how gender intersects with sexual and cultural identity. Our discussions will be structured around close readings of texts, paying attention to formal issues and narrative strategies. The course will be writing intensive, practicing skills such as persuasive argumentation, close literary analysis, and correct usage of literary and secondary sources.